What critical tool do you use in your business every day that is more than 2,000 years old? No, this isn’t the start of a joke. There’s a real answer — it’s paper. The creation of paper can be traced back to China’s Han dynasty in 200 B.C. yet we still depend on it for so many of our business processes, despite living in a world increasingly dominated by digital technology. How often are your business transactions closed by getting a signature scribbled on paper? Alternatives do exist. Vendors such as Montreal-based Silanis Technology offer e-Signatures to take the place of the ancient ink-on-paper method. While the technology firm admits that e-Signatures haven’t been around for quite as long as paper, it makes it known it’s not a brand new technology either. It’s just that adoption hasn’t been rapid. We trust a signature on a piece of paper because it’s seen as secure. Once it’s on the paper, it’s hard to remove. Also, it’s unique to the person that signed it. So can a digital signature meet the same criteria? It turns out that it can do at least that, and more. “We believe that e-Signatures have stronger security than a wet ink signature since the document is more secure and the process is so well recorded,” says Alec Blundell, vice-president of individual life insurance at The Co-operators. A legal council at The Co-operators was impressed with the security and documentation at each stage of the e-Signature process, he adds. Silanis approaches security for its products from two angles, Masterton says. It collects evidence about what was signed by protecting it behind a digital, tamper-proof seal. It also collects evidence about the process taken to sign a document. That includes how long a signer spent on each page, what messages they exchanged, and how the document was experienced overall. “It makes it possible to completely recreate the signing event years after the fact,” she says. Even the most stringent of regulators – those of the financial variety – now accept that e-Signatures can be trusted. Masterton points to the Uniform Electronic Commerce Act, which explicitly says that e-Signatures can’t be denied legal effect just because they are electronic. The Act is also technology-neutral, meaning it doesn’t specify what method should be used to create trustworthy digital signatures. It also says that just about any place a wet ink signature is accepted, a digital signature is accepted, though there are a few exceptions such as wills, trusts, and specific court documents. For Canadian firms, the knowledge that data is stored on home soil also helps with compliance, Masterton says. By meeting residency requirements, firms will avoid having to ask their customers’ permission for hosting data outside of the country. In fact, there’s reason to think e-Signatures are becoming more widely accepted by compliance enforcers. At RBC, David Beaton, senior manager of digital strategy and experience, says that the bank is now able to open up new accounts via online transactions by using digital signatures. Previously, wet ink signatures were required to do this in Canada, but as of October 2014 RBC has been opening accounts by letting people sign with their finger on a tablet or a smartphone. 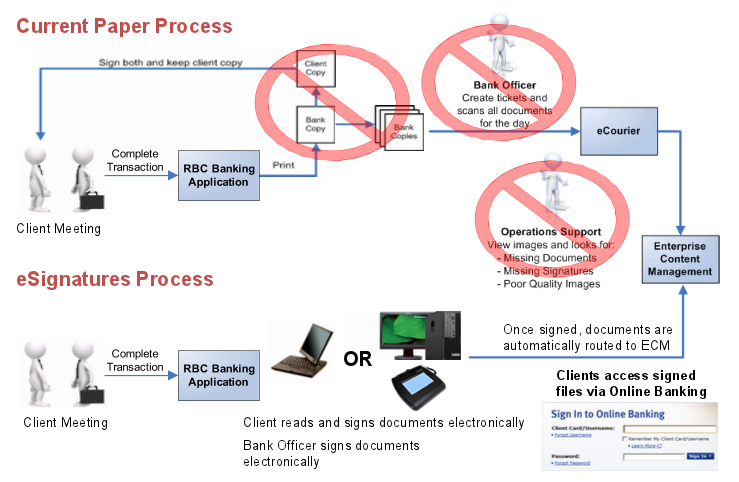 A comparison of RBC’s workflow before and after implementing e-Signatures. Silanis’ ability to record the entire process of collecting a signature, every time its done, has also been helpful to RBC, Beaton says. Silanis’ solution captures details such as the IP address logged on to complete a transaction, the order of which pages were signed, and the time spent on each page. All of that data can be exported too. The ability to trim down on the number of trees your business is ingesting in its daily diet is worth noting. Instead of all the photocopying, faxing, and printing that paper-based processes require, e-Signatures mean you can have everyone involved in a process view the exact same digital document. Both Beaton and Blundell raised the point that sustainability was a factor in wanting to move to e-Signatures. It tied in to overall corporate goals to run a business that was as environmentally friendly as possible. Not only do e-Signatures save trees, they save time too. Not having to shuffle around those piles of paper makes a big difference in a day’s work. At RBC, Beaton described the process that was followed after a deal was closed in 2011: get the applications produced and signed by the client, then the next day the compliance officer reviews the document and scans it into the records system. But now that the document is already digital, there’s no need to do that scanning. Plus, simple errors of having missing pages or pages out of order are avoided. At The Co-operators group, e-Signatures have made marketing operations more efficient too. A recent direct mail campaign gave recipients the option to go online and open an account. “Even though it targeted an older audience, a higher percentage went online to sign up than we expected,” Blundell says. 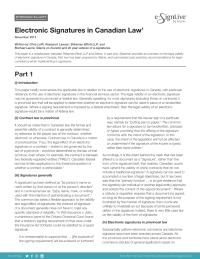 Neither RBC or The Co-operators group will tell you that implementing e-Signatures at an organizational level is completely without its hitches. Both described friction in integrating e-Signature technology with legacy applcations that were designed with only paper in mind. Also, old habits die hard. Beaton says his team “became like sales people going out to other lines of business to garner interest.” Blundell says that e-Signatures weren’t adopted until workers could complete the entire process of a work flow using the digital analogue to pen and paper. In the end, both feel the time spent was worth it. And it’s hardly suprising that some challenges were faced. They were trying to change a practice that goes back more than 2,000 years.